Earn $84.95 in Rewards credit (8495 points) What's This? 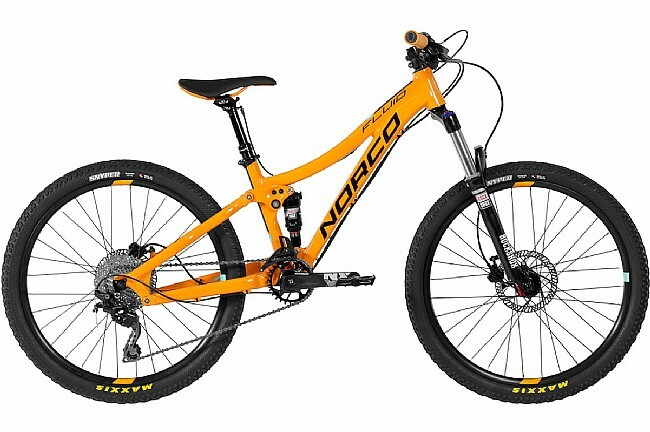 The Norco Fluid FS 4.2 brings all the trail capability of the Fluid series to smaller riders. With no-compromise geometry in an youth-sized frame designed around 24" wheels, the Fluid FS 4.2 is optimized to get maximum fun out of very trail. Hydraulic disc brakes deliver all the modulation and stopping power they'll need to handle the rougher stuff, while the trail-tuned A.R.T. suspension will help them take their riding to the next level. Frame Material: Alloy, 100mm travel. Fork: Rockshox Recon Silver, air spring 100mm, alloy steer. Rear Shock: Rockshox Monarch R.
Shifters: Shimano Deore M-610, 10 speed. Rear Derailleur: Shimano Deore Shadow Plus SGS 10 spd. Crankset: Samox crank w/28T 152mm. Bottom Bracket: Square Taper Cartridge. Cassette: Shimano HG-50 11-36T 10 spd. Brakeset: Tektro Hydraulic disc brake w/shorter reach. Handlebar: Norco 6061 alloy 1” rise bar. Stem: Short reach 35mm ext MTB stem. Saddle: Norco Jr. XC trail saddle. Seatpost: JD TransX dropper post w/remote lever, 30.9mm. Rims: Alex DP21 double wall I21 Tubeless ready. Tires: Maxxis Snyper 24x2.0 folding bead.